and I have eight gerbils in total in our home. I absolutely love them, I find myself smiling so hard when I'm watching them enjoy a new cardboard tube or their little faces pop up and greet me when I walk by. People ask me how I can get so attached to such small animals with limited lifespans. Here's a bit more about gerbils. Gerbils are so friendly, quickly grow accustomed to human company and displays of aggression to their owners are incredibly rare. They are pretty easy going little things! They quickly feel at ease in your palm and I absolutely love how they each have their own personalities. 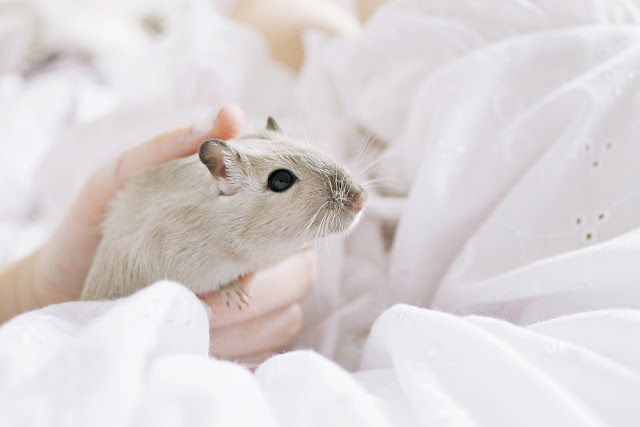 There are definitely gerbils in my clan that are outgoing and confident like Hei Hei, a little skittish like Sushi and incredibly quirky definitely MeeMoo*. They come in a huge range of colours... golden agouti (brown) which is most commonly found, argente golden (golden peach) and even Siamese and Burmese like other furry friends. I have Siamese (Hei Hei) Burmese, golden agouti and light colourpoint agouti (white with grey tips) in my clan. They have the quirk of drumming their hind legs whenever they are frightened by something and it's so funny to watch them all join in one by one as they register the threat. They have a big love of sand baths and burrowing, making homes underground. I recently invested in gerbilariums like this one, they absolutely love the extra space. They love to head but anything and everything! It's the funniest sensation to have a gerbil spin around, headbutting and trying to bury in to your palm. Hei Hei absolutely loves shoving his big silky gerbil man head in to my palm and crook of my elbow. He does it to his sand bath, his train and his bedding and placing a cardboard box in the cage results in an hour long series of scratchy-burrowing noises. I give them smoothie boxes but any empty cardboard box will do! They wake up all times of night and they will wake you up too! They get embarrassed and it's the cutest thing! Pua and Sushi especially spring to mind here. Sushi is very image conscious and won't let anything betray his inner playful side. I catch Pua going to town on his wooden chew toys, carrying them around and headbutting them; when he notices I'm watching he gets so sheepish! The dads spend a great deal of time parenting. Gerbils are different to many other animals in that the females rule the roost and are the most territorial, more likely to start a fight than the males. I definitely have a good few dominant females in my group ehem MeeMoo and they are so intelligent and curious, right little characters of their own. The males tend to be more relaxed and laidback and go crazy over babies when they arrive, they love to sit on them, groom them and shower them with love. Hei Hei here has just become a dad again and I felt pretty guilty involving him in a photo session, he was so eager to get back to his little family! *Oscar had the honour of naming MeeMoo haha! Along with Hei Hei we have Tefiti, MeeMoo, Mooshie, Pua, Boba, Molang and Sushi, not remotely Moana inspired at all haha. I am currently looking to find homes ahead of our most recent litter, Siamese, Burmese and light colourpoint agoutis shamelessly promoting my gerbies to you guys haha ♡ I hope you're having a lovely relaxing Easter weekend/April Fools day! oh my goodness they are SO cute! We ended up with a Hamster instead, but Gerbils are SO sweet! Oh my gosh you're a gerbil breeder?!! That's too cute. And you captured how cute gerbils are so perfectly in these photos. Makes me want one. Oh my gosh, your gerbils are so adorable. And they have the cutest names ever!!! These are the cutest! So adorable to watch them running around. Ooooh, they are so incredibly cute! And the fact that they get shy is adorable! Funny enough I wasn't even aware of the excistence of Gerbils until now! They look so freaking cute!!! They are so adorable! 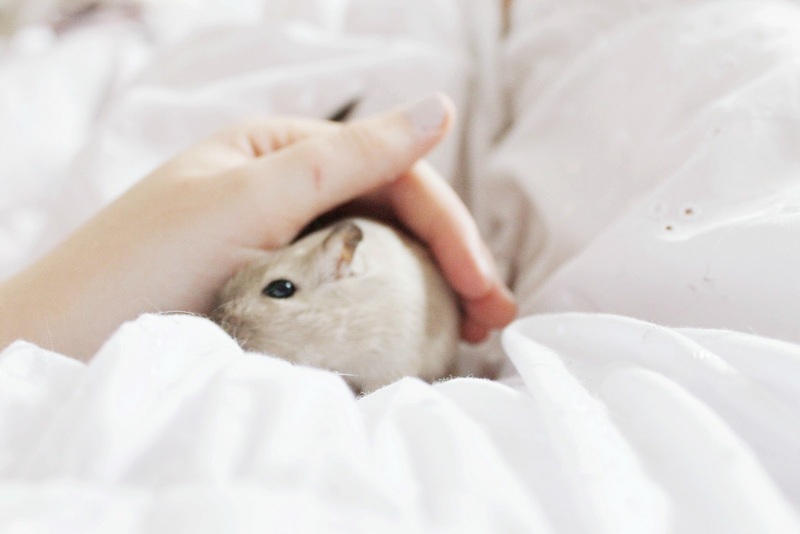 I've never raised a gerbil, but I had hamsters growing up, and they were the sweetest things. I love their little tiny hand-paws, and how they pick up things and hold them while they eat. Who can not think they're just adorable!? 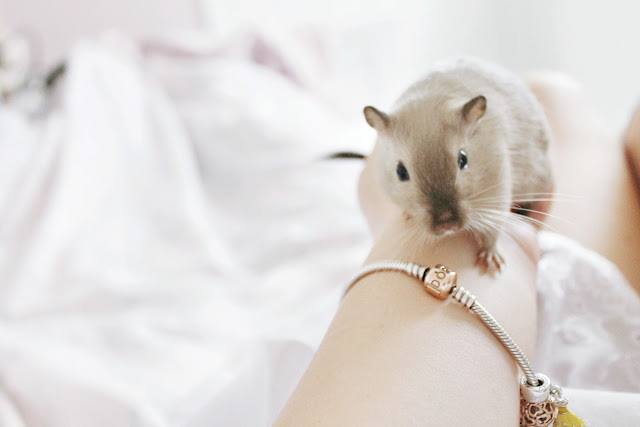 Gerbils are the cutest! I totally understand why you'd get attached to them, even small animals have their own personalities and playing with them is always fun. I wonder how many you'll end up having, eight is already quite a few! I hope we'll have some updates! Oh my gosh this is wonderful. So cute.